Basketball had always been part of my life. From the time I was 8 up until my 16 birthday, I was a basketball player. I practiced everyday for 3 hours, I played on 3 different teams at the same time and was always at tournaments and games on the weekends and sometimes during the week. But something changed. Basketball just wasn’t for me. At the basketball court near my house, there was also a tennis court. One day I watched some people playing and I was immediately hooked. They were so good, incredibly consistent and they seemed to love to play. That was something I had lost with basketball, I didn’t love it, I didn’t even want to play. I was done and I had found my new sport. I eventually got a coach, and started training intensely to try to become the best I can be. 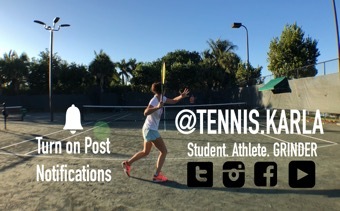 I started @tennis.Karla because I thought it’d be cool to share my story with other people who also love tennis and just being able to spread the love. I had gotten into a car accident a week before setting up the account and I couldn’t do any physical activity for 2 weeks. During those two weeks of immobility I grew increasingly bored and thought it would have been nice to be able to see something like the page I’ve been building up. When I was cleared for physical activity, I had to get back into my training routine and I wanted to share my story with everyone. Starting up a social media account can be daunting. Make sure you have a story. Everyone LOVES a good story. Without a story, you have nothing. Even the simplest clips, have a story. A simple video that about someone playing on the wall has a beginning, climax and end. The beginning is when the person starts hitting on the wall, the climax would be a winning shot hit, and then the end when the person stops playing. Here’s a clip of me hitting on the wall, this clip got over 40,000 views. Share things that are actually happening to you, people want to know all the behind the scenes and what’s the real story. Have fun, people can tell when it’s fun and when you’re faking it, so make sure to make the most out of the experience and enjoy the journey you’re experiencing. Those are the top 3 tips that have been helpful in my success with @tennis.Karla and my tennis story, hopefully they helped you too!